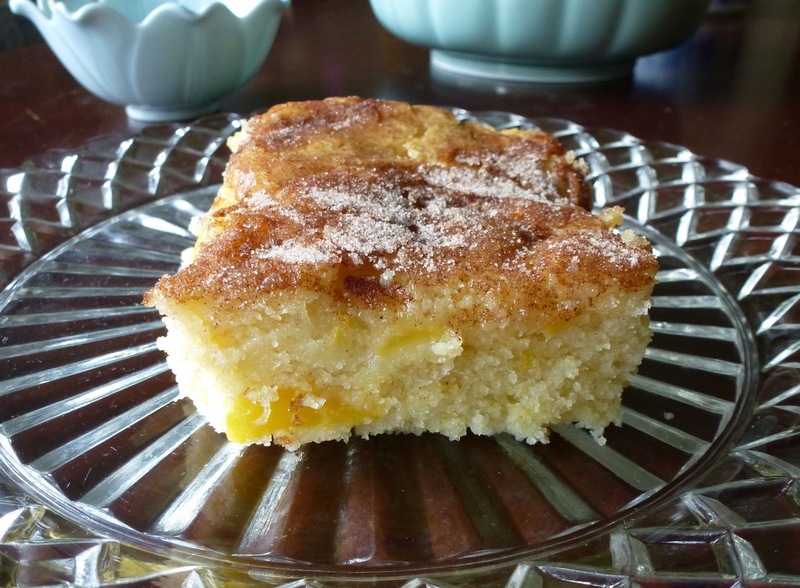 Each summer I try a new recipe for peach cake. Most of the time the results are mediocre, but I recently came across this recipe on the blog Italian Food Forever, and modified it to suit my taste. It is wonderful. It is so moist and flavorful, using yogurt in place of milk or sour cream. You can also take the basic cake and substitute other fruit such as apricots, raspberries, blueberries, plums, apples or pears. I think it tastes best the day after you make it because the flavors have time to mature. Make this now while peach season is at its peak. Preheat oven to 350 degrees. Spray a 9×13 metal baking pan. Line pan with parchment. In a mixing bowl beat butter and 2 cups of sugar until light and fluffy, 3-4 minutes. Add eggs one at a time, scrape the bowl so the batter is evenly mixed. Add yogurt and extracts. In a separate bowl combine flour, baking soda, salt and nutmeg. Mix dry ingredients into the wet then fold in chopped peaches. Pour batter into prepared pan. Use a spatula to smooth the batter to the edges. Mix together for the topping, 1/4 cup sugar and cinnamon and sprinkle it over the top of the cake. Bake for 40-45 minutes, rotating the pan half way through baking, until an inserted toothpick comes out clean. Cool on rack. Serves 10-12. This entry was posted in Cakes, Desserts, Fruit. Bookmark the permalink. Gorgeous! The crumb on this cake looks beautiful! Thanks for sharing! Thank you for commenting. It’s such a good recipe. Enjoy!